September has arrived and the kids are back in school. Why don’t you consider coming to my classroom this month for some Basic Nature Photography lessons, or learn Lightroom software for importing, organizing, editing and sharing your photos? “Basic Nature Photography” is on Wednesdays in Weslaco at the Valley Nature Center (Sept. 16, 23, 30, Oct. 7). “Learn Lightroom” is on Monday and Tuesday evenings in McAllen in my studio at the Incubator (Sept. 21, 22, 28, 29, Oct. 5, 6). Contact me directly for more information via my website. Be sure to click the photo to see the full version of this Green Jay! 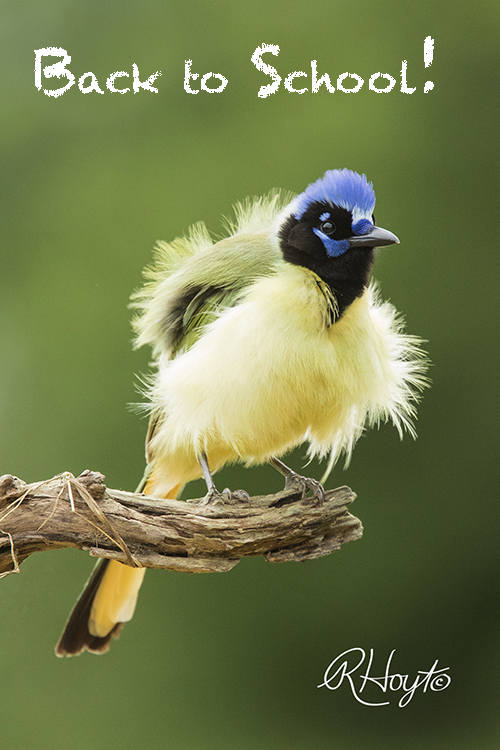 A Green Jay fluffs its feathers in order to appear larger, as it notices a potential enemy in the deep south Texas thorn scrub.